Founders of LinkdPro and Octopus Eugene de Beer and Scelo Makhathini. 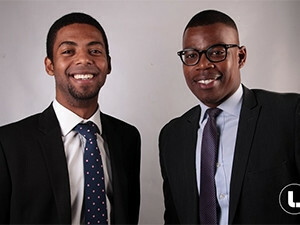 Young duo, Scelo Makhathini and Eugene de Beer, are the brains behind two new on-demand digital platforms that connect independent professionals with companies looking for specialist industry expertise. LinkdPro and its extension service named Octopus allow employers to shortlist and send interview requests to professionals. Makhathi, who is a charted accountant by profession, explains: "LinkdPro is actually inspired by two trends that we've seen in the market. First, we saw that the professional services model is actually ripe for a disruptive alternative...and then we noticed while we were busy developing LinkdPro that a lot of experienced people, particularly independent consultants, are actually leaving their permanent positions and are starting to consult independently. "As a result, companies looking for expertise on a project basis struggle to find consultants. So what we've created is basically a solution that connects the two," he explains. "HR is the foundation upon which great businesses are built. It ensures great people get to work together towards a common goal. When traditional HR moves to digital platforms, a plethora of inefficiencies are resolved and the status quo is challenged. Digital platforms have the ability to deliver a more personal HR experience simply because technology has radically changed human relationships and the way we relate to other people, institutions and companies. What we are capable of doing with technology today, was unthinkable only a few years ago. We were able to intercept this trend, gaining an advantage over traditional services." The system uses artificially intelligent algorithms to match client project needs with independent professionals. "We use big data and machine-learning computer technologies to identify only top independent professionals based on their profiles, and we take it to the next level by performing an analysis of compatibility with client and project needs." The system hasn't moved to apps yet. "However, our platforms are built with a mobile first approach, where regardless of the form-factor the user will still have a great experience," he adds. According to De Beer, a computer scientist, the rapid growth of LinkdPro spurred the idea for an even more niche platform. "Following the launch of LinkdPro, a lot of our clients started asking that we get them permanent staff, particularly finance professionals. And so Octopus was born - to solve a real business need." Octopus launched at the start of April and has so far signed up in excess of 40 finance professionals, most of them being qualified chartered accountants. Different to the norm, the company pays candidates on successful placement. "We guarantee R3 000 pay-out on a successfully placed professional as a token of appreciation. What we are offering is disrupting the traditional recruitment models. By awarding this amount to candidates, we are simply thanking them for trusting us in finding them their dream job. Companies do not pay anything to register or use the platform. Both platforms are free to use. "On LinkdPro, clients do not pay any placement commission/fees if we find them a consultant ? LinkdPro withholds 20% from whatever is being paid to the consultant. "On Octopus, the client only pays commission when we have successfully placed one of our job-seekers with them. The 10% is calculated on the CTC of successfully placed job-seekers." Makhathini adds LinkdPro is doing well, with more than 500 consultants registered on the platform. "LinkdPro already has mandates outside of the country through its SA clients as well as signed up clients. As Octopus is still a relatively new platform, our plan is to solidify our market positioning in South Africa first before venturing outside of South Africa."